Located in a remote part of Eastern Colombia, the region known as the Matavéni forest is considered a transition zone between the great jungles of the Amazon to the south and the extensive savannas of the Orinoco to the north and east. It is characterized by its sweeping plains, tropical jungles and great rivers. This area is of special biological interest, not only because of its position geographically, but because of its incredible state of conservation, with less than 5% of the total surface transformed into agricultural areas or otherwise deforested. This is a place to hear the sounds of birds and take in beautiful landscapes while sharing the river with giant river otter and Amazon river dolphin, or boto. It is also home to many indigenous communities living in harmony with the forest. A massive river and lagoon system surrounded by pristine jungle and managed to perfection by a local indigenous group, the Rio Matavéni is a world leader in the fishing of peacock bass, or tucunaré. 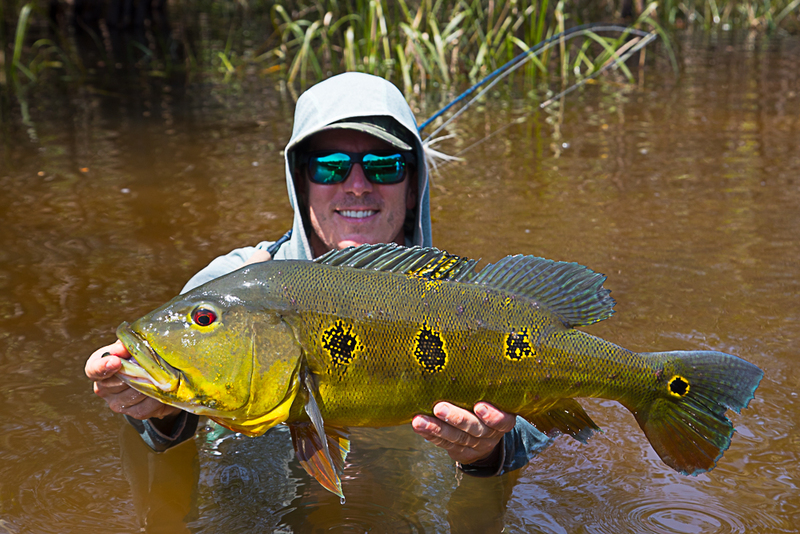 This incredible river held the IGFA world record for many years for the species Cichla temensis, or speckled peacock bass, and today still holds several world records for tippet. 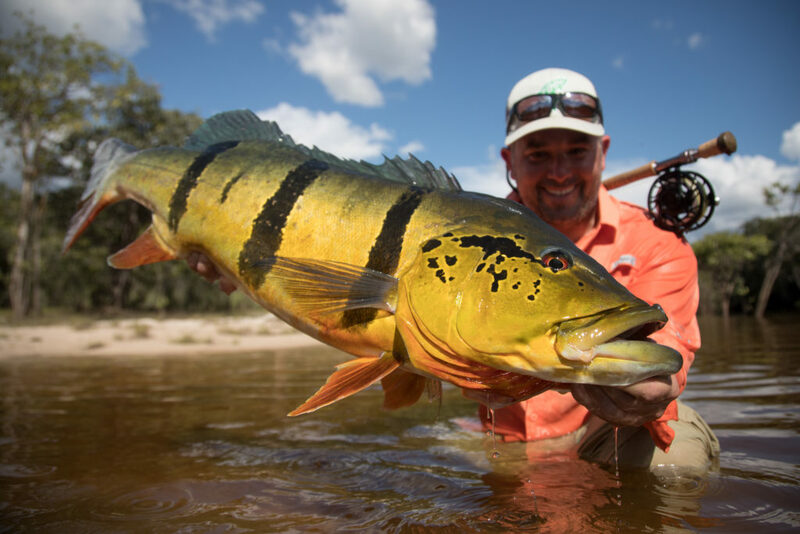 The best season for this fishery is January, February, March and April, summer time in Colombia, when river levels drop and conditions become ideal for fishing. This river has recently emerged after long periods without the visitation of sport fishermen, and now together with the indigenous community there are special sport fishing regulations in place to protect it. Access is limited to exclusive groups of maximum 10 fishermen per group with a strict resting period of 9 days between groups. Anglers are also only allowed to use single hooks on all lures and flies. With these regulations in place, anglers can rest assured they will be greeted with a pristine river full of lightly pressured peacock bass and other exotic species. 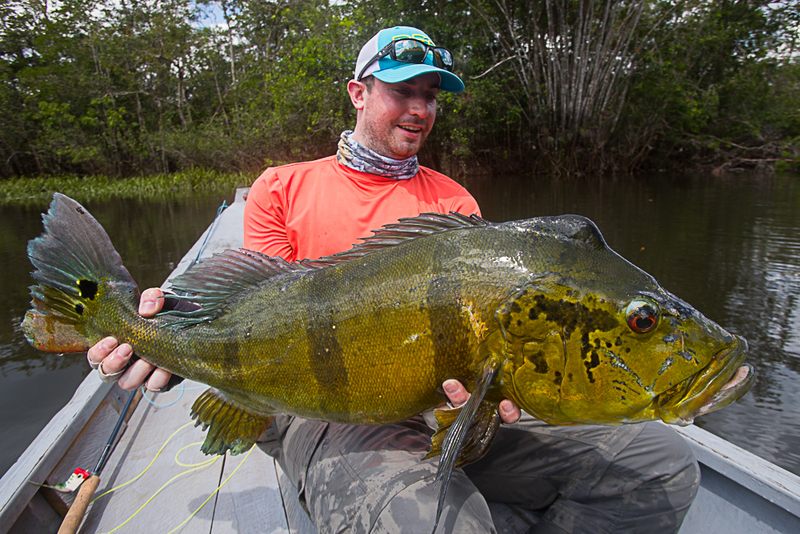 Target species are mainly the tucunaré or peacock bass (in this river there are several different species of peacocks, among them the larger speckled peacock scientifically known as Cichla temensis as well as the slightly smaller butterfly peacock (Cichla orinocensis), the payara or cuborra (Hydrolycus spp. ), sardinata real (Pellona castelnaeana), piranhas or caribes, cachama (pacu), striped catfish, cajaro or tararira (Hoplias malabaricus), agujeto (Ctenolucius Hujeta), diente perro, yamú and moncholo (Pimelodus albicans). Each fisherman will have a 4-person tent for themselves complete with air mattress or cot, electrical outlets to charge batteries, sheets, pillow, and towel. The camp itself will have a common dining room, kitchen, bathroom, and showers. 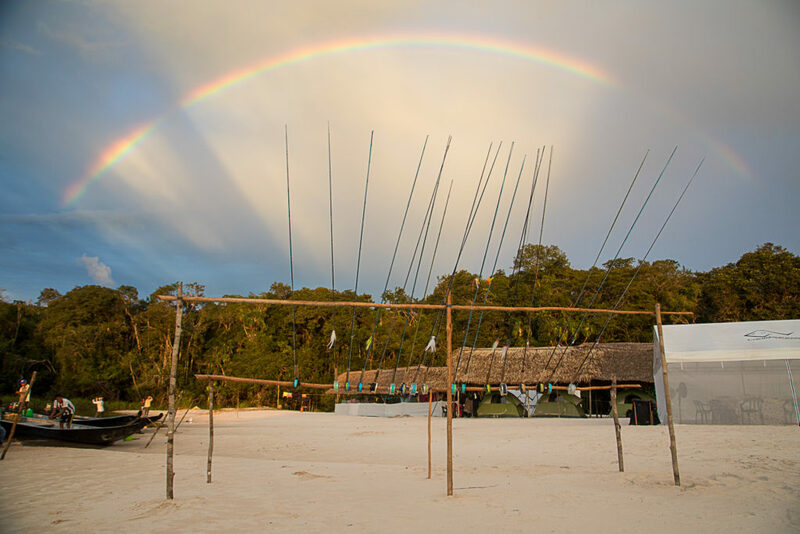 The group is under the care of the local indigenous community, who provides extremely knowledgable guides and help setting up and operating camp. Meals will be prepared by a cook using local ingredients such as fish, yucca, and plantain, and a variety of fresh Colombian meats. The tour’s departure point is Bogotá, Colombia. Anglers will arrive to El Dorado International Airport (BOG). From there, we catch a domestic flight (1.5 hours) to Puerto Inírida where the real adventure begins. All fishermen in the group board a transport boat and go downstream on the Inírida River to the Orinoco and finally to the mouth of the Matavéni River (4 hours approximately). There the group will find their guides, who are part of one of the local indigenous communities. We change to smaller boats – two fishermen per boat – and continue upriver for three or four hours until we arrive at camp on one of the river’s white sand beaches. If you are a U.S. citizen seeking to enter Colombia as a tourist, you do not need a special visa to enter. A valid passport is required, however, and upon entering Colombia travelers are granted a tourist visa. Some other countries, however, do require a special visa. Inquire with us or your local Colombian embassy to be sure. 8/9/10/11 weight setups plus backup rods, fly line, tippet material, wire leaders, etc. A complete trip preparation package with all pertinent information will be provided upon booking. Day 1 – Arrival in Bogota (BOG). Private transfer from airport to hotel included. Lodging included. Meals not included. Day 2 – Midmorning domestic flight Bogota – Puerto Inírida. One night lodging in Puerto Inírida included. Meals included. Transportation included. Day 3 – All fishermen in group board transport boat and go downstream on the Inírida River to the mouth of the Matavéni River. There the group will find their guides, who are part of one of the local indigenous communities. Change to smaller boats – two fishermen per boat – and continue upriver to camp. 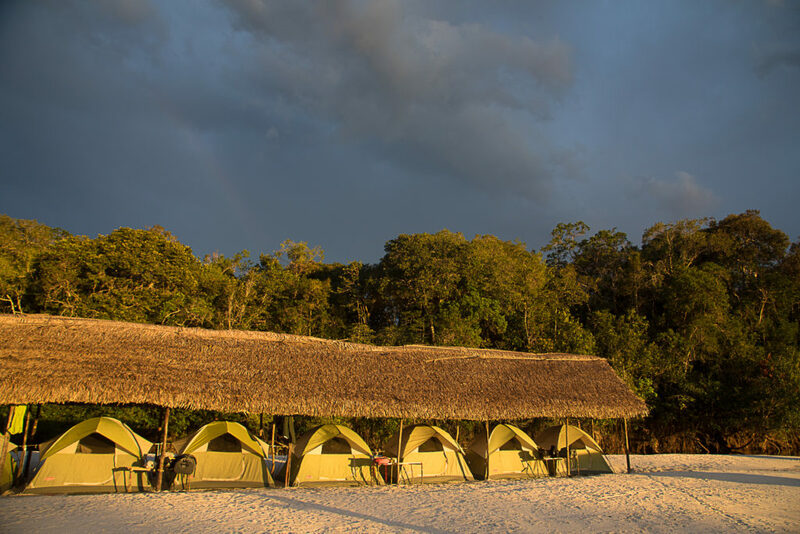 Arrive at camp on one of the river’s white sand beaches. Day 4-9 – These six days will be fished on the Matavéni River with two fishermen and a guide and/or captain per boat targeting peacock bass and various other species. 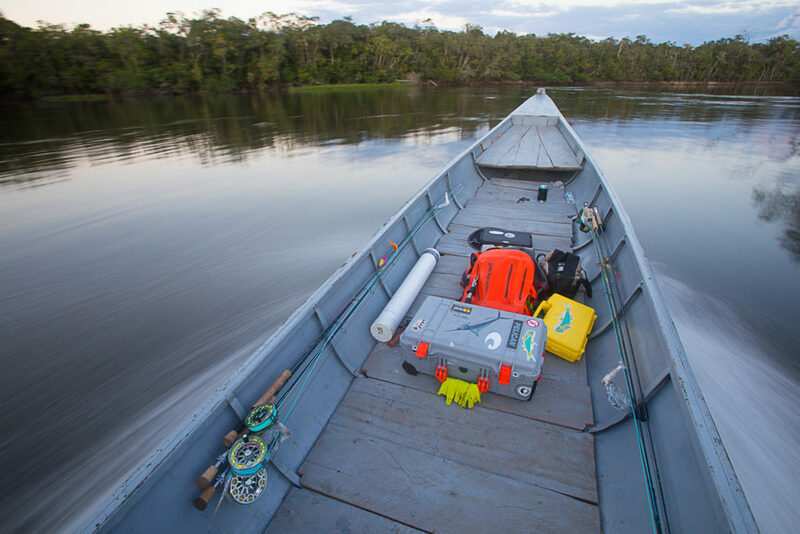 Day 10 – Leave camp with all luggage heading down the Matavéni until we reach the Orinoco River. Here group ascends for about 15 minutes until reaching a series of rapids and fish in search of payara and sardinates reales. Fishing will be 1/2 day and then group continues back to Puerto Inírida. One night lodging in Puerto Inírida. Meals included. Transportation included. Day 11 – 1/2 day free to rest or enjoy Puerto Inírida. 1:00 PM transfer to the airport. Domestic flight Puerto Inírida – Bogota (Leaving around 3:00 PM and arriving around 4:30 PM). Departure from Colombia or staying one night in Bogota and departing the next day. (International flight must leave after 7:00 PM). Private transfers between airport and hotel included. Lodging included. Meals not included.